Continuing with the theme of enjoying one last taste of summer, I saw these lemon blueberry crumble bars on Recipe Girl a few weeks ago and knew I had to make them. They looked like the perfect opportunity for using up the last of the summer blueberries, plus lemon always makes me think of bright, sunshine-filled summer days. 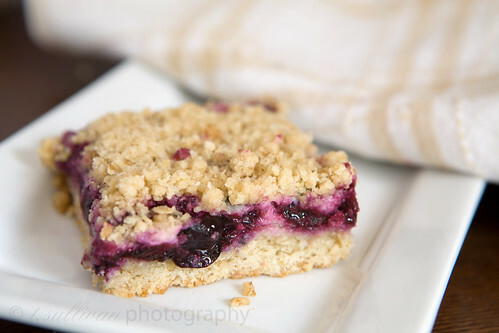 I’ve had blueberry bars before, but what makes these bars better than average is a layer of silky, creamy lemon curd. The tartness of the lemon and blueberry is offset by a subtle sweetness in the shortbread-like crust and crunchy crumble on top. They’re half blueberry bar, half lemon bar, and all delicious. 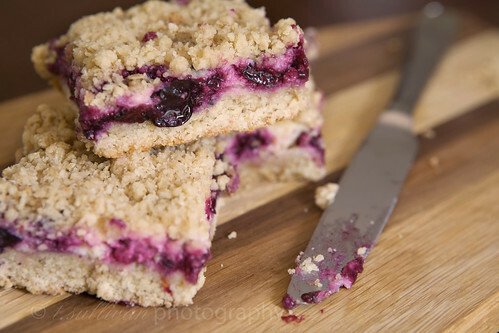 Next time you’re looking for a dish to take to a potluck or picnic, make these bars. The other guests will love you for it! And you won’t have to waste your energy trying to convince yourself not to eat the whole pan at once. I halved this recipe, so visit Recipe Girl if you want the full recipe. I also decided to take a short cut and make mine in a food processor. (I’m lazy like that.) The result was a finer crumb on top. If you want a chunkier crumble, use your fingers or a pastry cutter. The bars should be chilled before cutting to ensure clean cuts. ** The original recipe calls for 1 whole egg white in the crust. Since this is half of the recipe, you have two options. Beat the egg white in a small bowl, then eyeball about half of it to use in the crust, OR use the full egg white. If you use the full egg white, flour your hands when you press it into the pan because it will be sticky. Either way, the crust should come out fine. Line 8×8 inch baking pan with foil, leaving enough overhang on the ends to grab once the bars are done. Spray foil lining with cooking spray. In a food processor, pulse the flour, oats, sugar, salt, and baking powder until combined. Add the butter and continue to pulse until combined. Set aside 1 cup of the crumb mixture in a small bowl for the topping. Bake the crust about 12 minutes, or until the top feels dry to the touch. While the crust bakes, whisk the condensed milk, lemon juice, zest, and egg yolk in a medium bowl. Set aside to thicken for 5 minutes. When the crust is out of the oven, sprinkle blueberries evenly over it. Drop spoonfuls of the lemon curd mixture over the blueberries and spread gently to distribute evenly. Bake about 8 minutes, until the lemon mixture begins to form a shiny skin. Pull the bars out of the oven and sprinkle the 1 cup of reserved crumb topping over the bars. Bake 25-30 minutes more, until filling is bubbly and the topping is lightly browned. Cool the finished bars in the pan on a rack for about an hour. Carefully lift them out of the pan using the foil overhang and transfer to a wire rack to cool completely. (Chill in the refrigerator before cutting for cleaner cuts.) When cool, cut and serve. Store leftovers (if you have any!) tightly wrapped in the refrigerator for up to a week. Yum! Love your shortcut w/ the food processor too. My favorites! These were so delicious! Those look gorgeous – I’m looking forward to trying them. Scrummy! I made these as well and they were so good! Ooooh, these look great! I like the fact that there’s a separate layer of lemon curd. Definitely bookmarked! These look and sound incredible, what a brilliant idea. Truly beautiful photos too!